Do you enjoy the zing and crunch of a gherkin pickle? You might be surprised to learn that sweet gherkin pickles don't just taste good, they have several health benefits. Adding them to your diet can increase your intake of a few nutrients. These pickles are prepared using a gherkin vegetable, which is a cucumber that produces smaller fruit than a garden cucumber. These delicious cucumbers go through a "pickling process" where they are marinated with vinegar, sugar, and spices. Homemade pickle recipes are available, but you can find sweet gherkins at supermarkets as well. A diet that contains a moderate amount of fat and calories allows you to control your weight, which reduces your risk of health concerns like heart disease and cancer. It can also increase your intake of essential nutrients like vitamin A, folate, calcium and iron. One large sweet gherkin pickle only contains 32 calories and less than 1 gram of fat. A great benefit of eating gherkins? They're an excellent way of adding a little spice and flavor to your favorite low-fat and low-calorie foods. You can slice a pickle and add it to salads and sandwiches, or nosh on them straight out of the jar. Vitamin A is a nutrient that supports healthy immunity by producing white blood cells, which protects you from viruses and bacteria that cause illness. It is important for reproduction, vision, and bone growth. One large sweet gherkin contains 276 IU of vitamin A. Men should get 3,000 IU of vitamin A each day, while women need 2,310 IU daily. Beta-carotene is a nutrient that converts to vitamin A in the body, so including sweet gherkins in your diet is an excellent way to get the other benefits of pickles, while adding in vitamin A and beta-carotene. There are 114 micrograms of beta-carotene in just one large sweet gherkin. Adult females need 90 micrograms of vitamin K each day, and adult males should get 120 micrograms daily. One large sweet gherkin pickle contributes 16.5 micrograms to this total. Vitamin K is essential because it helps your blood clot. Increased amounts of vitamin K can treat bleeding disorders caused by liver disease and malabsorption. Adequate vitamin K intake is also important for the health of your bones and can increase your bone density. Having healthy, strong bones reduces your risk of osteoporosis as you age. The benefits of eating gherkins come with a caution. Sweet gherkin pickles are high in sugar and sodium. The sugar found in gherkins is known as "added sugar," which means that it doesn't occur naturally in the gherkin vegetable, but is added during preparation. According to the American Heart Association, added sugars contribute zero nutrients to foods, but can add calories. Eating foods with added sugar can lead to extra unwanted pounds, obesity, and reduce heart health. Another downside to sweet gherkins is that they are packed with sodium. A large gherkin pickle contains 160 mg of sodium, which is quite a significant portion of the maximum recommended daily allowance of 2.3 grams or about one teaspoon of table salt. People with diabetes, kidney problems, or high blood pressure need to monitor their daily intake of salt, which might make sweet gherkins a poor choice. Before you grab for a big jar of sweet gherkins, consider both the negatives and benefits of pickles. You may also want to check with your doctor or dietician before you enjoy this zesty, low-fat snack or garnish. Are Pickles Healthy to Eat? 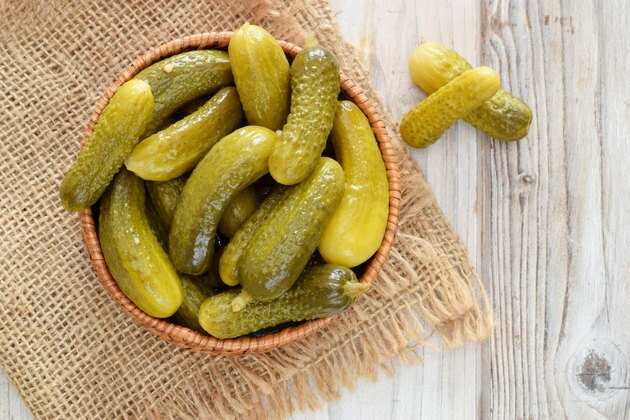 What Are the Health Benefits of Kosher Dill Pickles?